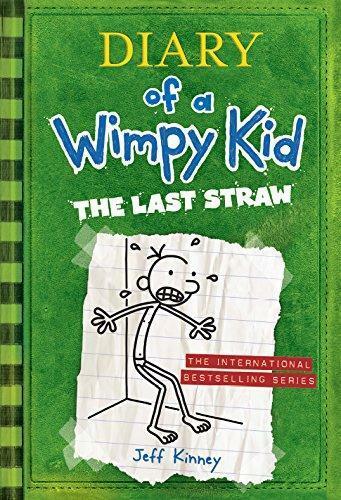 "The Last Straw" is the rib-tickling, belly-aching and laugh-out-loud third title in the bestselling and award-winning "Diary of a Wimpy Kid" series by Jeff Kinney. Perfect for both boys and girls of 8+, reluctant readers and all the millions of devoted Wimpy Kid fans out there. "The Last Straw" was also combined with "Dog Days", the fourth book in the series, to become the major movie hit at the box-office "Diary of a Wimpy Kid: Dog Days". The third hilarious book in the bestselling phenomenon that is the "Diary of a Wimpy Kid" series. You know how you're supposed to come up with a list of "resolutions" at the beginning of the year to try to make yourself a better person? Well, the problem is, it's not easy for me to think of ways to improve myself, because I'm pretty much one of the best people I know. But Greg's dad has other ideas. He wants Greg to change his wimpy ways, toughen up and enlist in other 'manly' endeavours. And when he threatens to send Greg to military academy, Greg realizes he has to shape up...or get shipped out. Praise for Jeff Kinney and the "Diary of a Wimpy Kid" series: "The world has gone crazy for Jeff Kinney's "Diary of a Wimpy Kid" series". ("Sun"). "Kinney is right up there with J K Rowling as one of the bestselling children's authors on the planet". ("Independent"). "Hilarious!". ("Sunday Telegraph"). "The most hotly anticipated children's book of the year is here - "Diary of a Wimpy Kid". ("The Big Issue"). As well as being an international bestselling author, Jeff Kinney is also an online developer and designer. He is the creator of the children's virtual world, poptropica where you can also find the Wimpy Kid boardwalk. He was named one of "Time" magazine's 100 Most Influential People in 2009.